Yes, my obsession with ridiculous titles for my blog posts shows no signs whatsoever of abating! 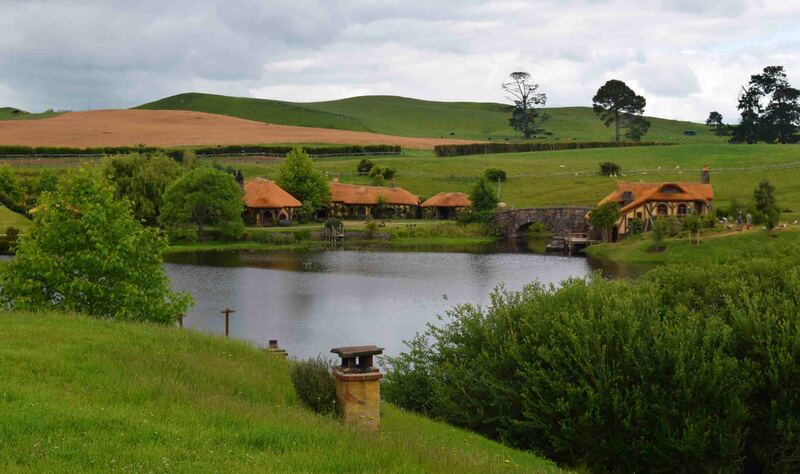 I’m not sure if everyone is aware, but the farm used for ‘The Shire’ as part of the Hobbit and Lord of the Rings films is now a tourist attraction. It’s basically a large number of various sized doors in the side of hills on someone’s farm, the actual houses are not there because, naturally, the interior shots were shot in a studio. He he! One Hobbit door as a wall behind it for pictures. 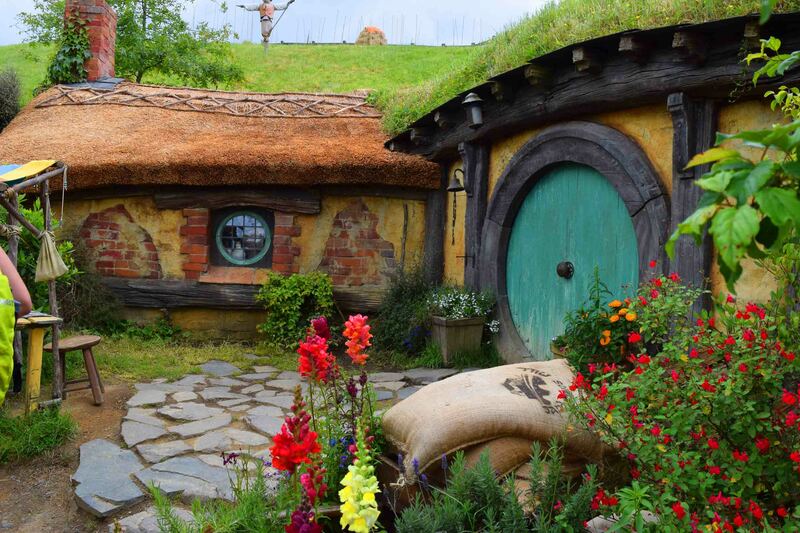 However, this hasn’t stopped Hobbiton becoming a ragingly popular tourist attraction. 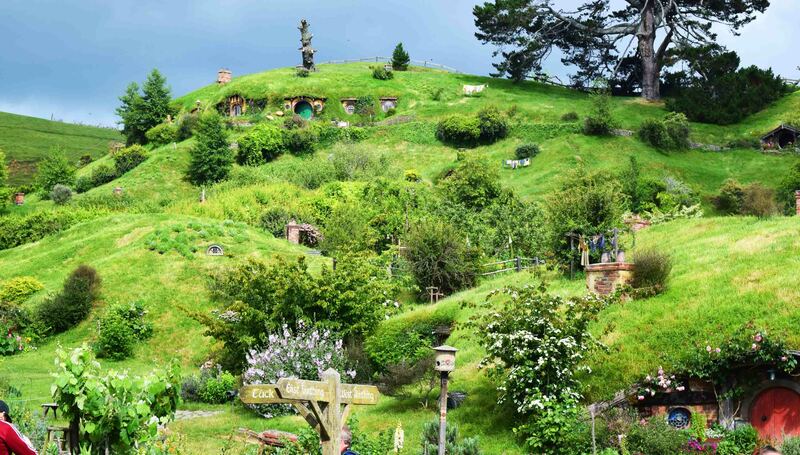 Nowhere in New Zealand did I see this many people flocking to see something, and to be sure it’s worth visiting and you’ll love the photos you take. Everyone does. And boy are there a lot of photos taken. Today I’m just doing a bit of a summary as to my experience and giving you a few facts and what to expect. And then you can consider whether the price is worth the visit. And the truth should be, prices set themselves and people wouldn’t pay it if they didn’t think it was somewhat reasonable value for money, right? It’s just that, well, Tokyo Disneyland is cheaper. If you turn up with your own car you’ll pay $79.95 for an adult ticket. That’s New Zealand dollars, so for a US equivalent that’s around $52. Which doesn’t sound as bad. 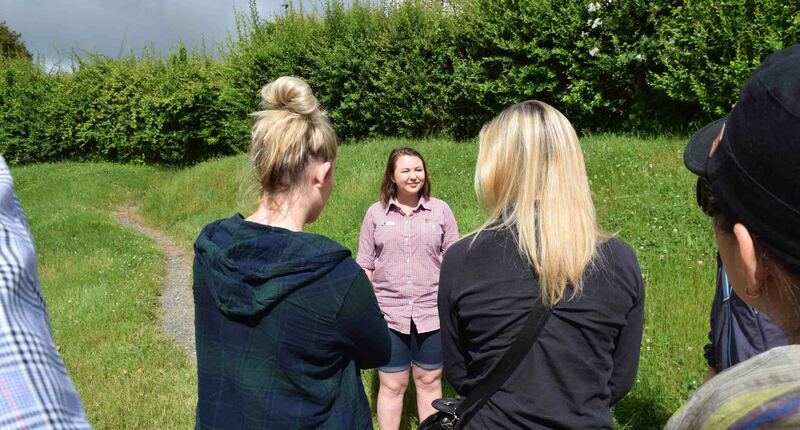 To drive numbers the people running the thing realise that it’s sort of out in the middle of nowhere, so they have return bus services to both Rotorua and Auckland. I was staying in Rotorua and the price is $114 per adult return. My hostel offered a discount, it was $106NZ return for my wife and I each. The thing is though, New Zealand is not a cheap country and so that’s the first thing you’ll need to bear in mind should you go there. All the attractions around Rotorua, with transport, started at around $60 and upwards. It was not a cheap getaway, but we did pack a lot in and it was satisfying in that way. Our guide begins the tour. 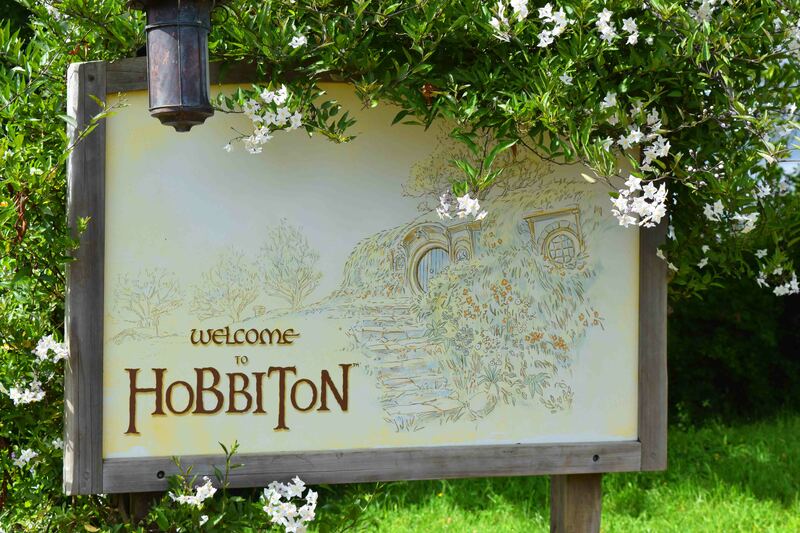 So, we had an hour long bus ride to the entrance of Hobbiton, where our guide came on board. You can’t just go there and wander about the place sadly (it’s my favourite thing to do!) you have a guided tour which goes for pretty much exactly 90 minutes. View across the hills to the Green Dragon. We were led around the hills going from door to door stopping for photos at most of them. It’s an incredibly beautiful area, the hills are kept green all year even through summer, and there is an undeniable magic in the air. Then the stories about Peter Jackson start, and they’re told as if the guide was there at the time. Which they weren’t. There appear to be a lot of Peter Jackson (the director of the films) stories. In fact, the bus driver had quite a few too. Little Hobbit clothes on the line. Awwww! A little wheel barrow! 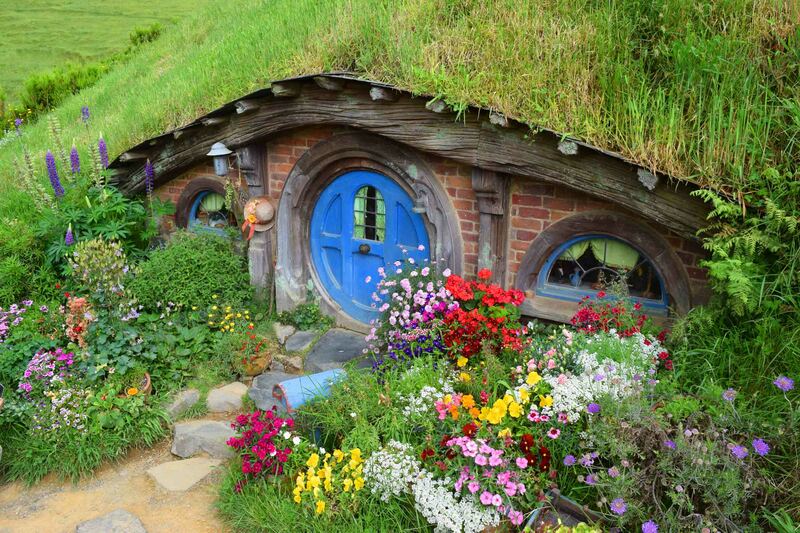 You’ll have certain ‘houses’ pointed out, like Sam’s house and of course Bilbo’s. 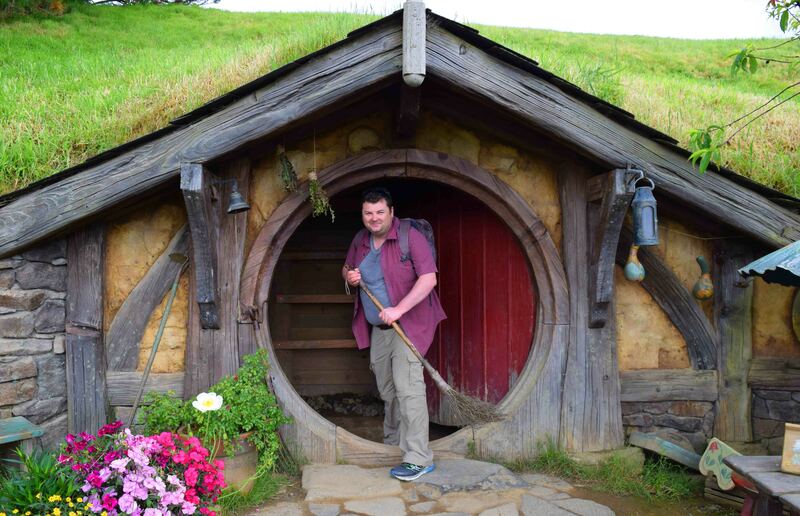 It’s interesting that there are variety of different sized doors, they are not all small as you might believe, some are even at 100% so that they would work with Gandolf. It’s very pleasant, you hear some very interesting stories (the occasional one doesn’t directly involve Peter Jackson!) 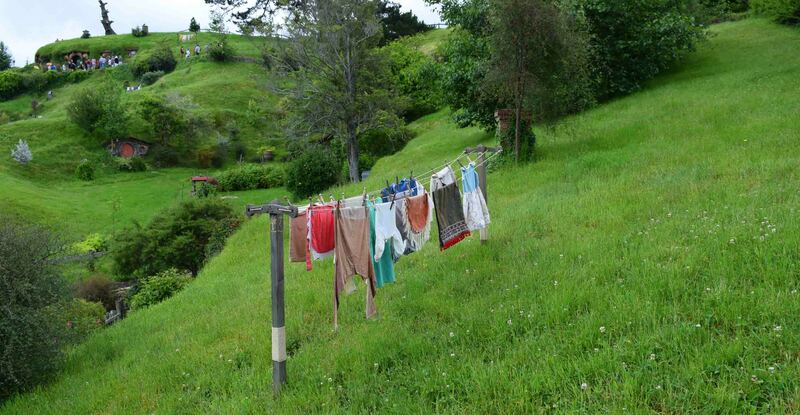 and the photos you get will probably make you ‘squeeeeeee!’ There are few other Hobbity things to see – a little clothes line for example. The bridge leading to the Green Dragon. 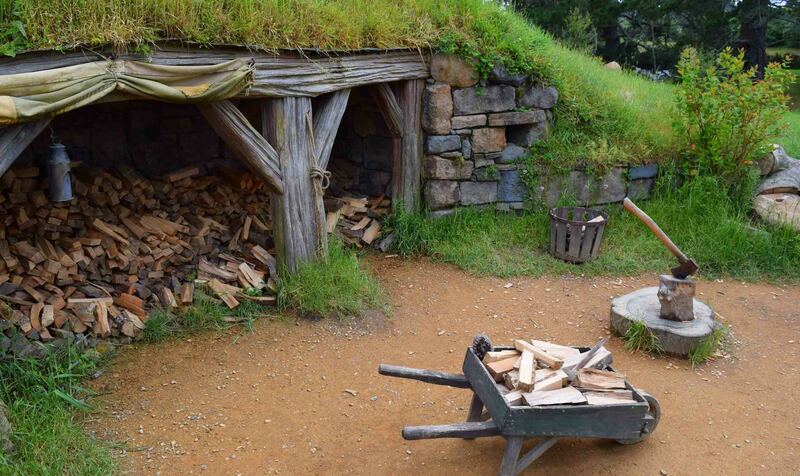 Inside the Green Dragon in Hobbiton. 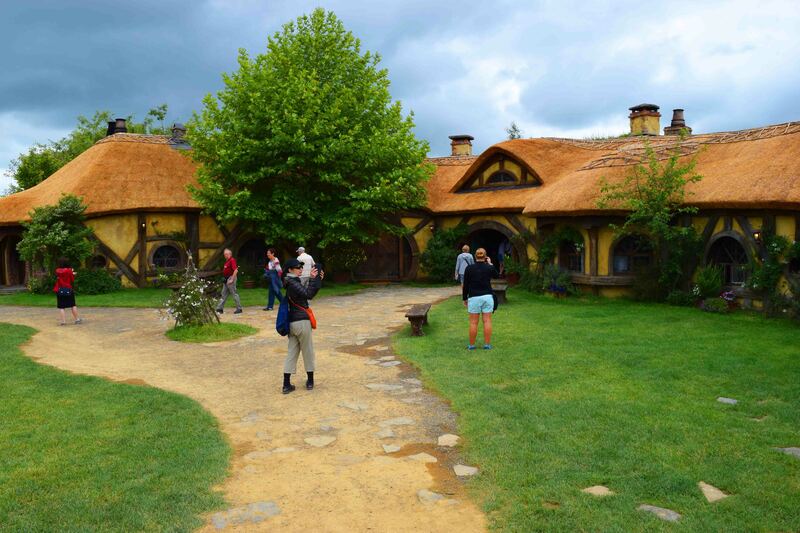 They do have an interior for the Green Dragon, the pub/inn used in the films. 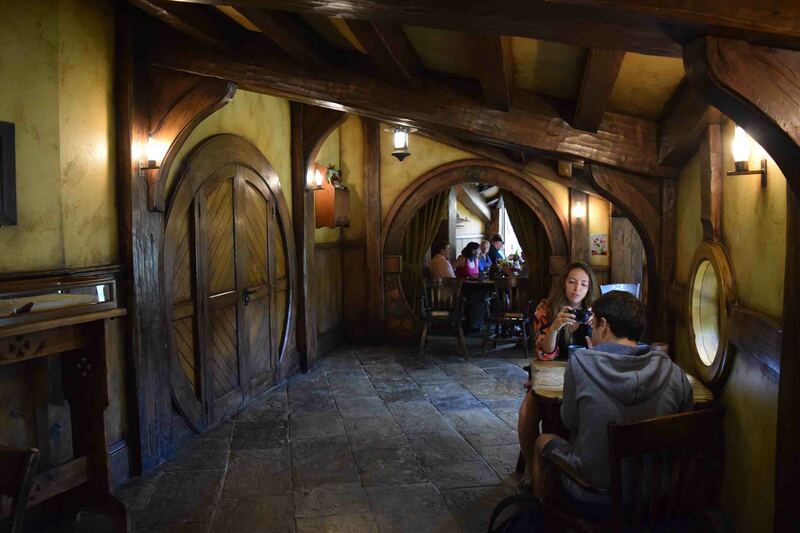 The interior was built for the attraction, it wasn’t the one used in the films – that again was a studio set. You get a free beer or cider with your tour (too bad if you’re not a fan of ale though) and can enjoy it in the pub. For about 10 minutes then your tour has ended and you have to get out of there. In fact, it’s all very rushed which is my major concern. I really would have liked half an hour at the end and more time during the tour, and a chance to explore by myself. But they have thousands of people every day coming through and they are all on tours. The groups themselves seem to be around 30 people. Is it worth it? Yes, I would say so but I would have happily paid a lot less for it. The owner of the land must be a squillionaire by now. I have to say I wonder if in ten years or so when the films are less in people’s minds whether its popularity will continue. But they are certainly making hay while the suin shines. And yes, there’s a nice old gift shop with so many choices. The bus took us back to Rotorua. We’d left shortly after eight and were back by one pm which left us plenty of time to do something else with the rest of the day – which we did. But that’s for another post. Does this sort of attraction appeal to you? 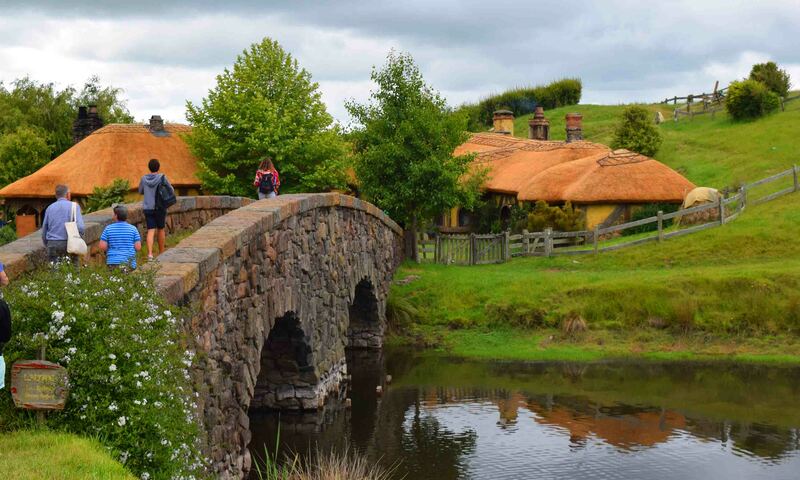 Have you been to Hobbiton, and if so how did you find it and do think it was worth the price? Please leave comments below – I may be slow to answer comments but I answer them all at once. May the Journey Never End! 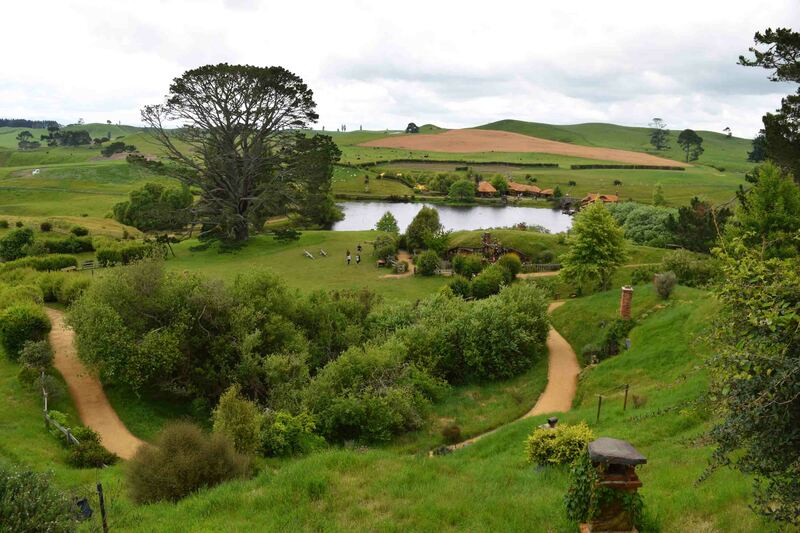 the countryside in New Zealand is pretty much perfect! Hmmm I think the Potter Studios is one place I need to get too! thanks for reading!